LDC’s Lisa Hutchinson, Leanne and Barry O’Sullivan, Glenalpine Station, and Mick Shannon. 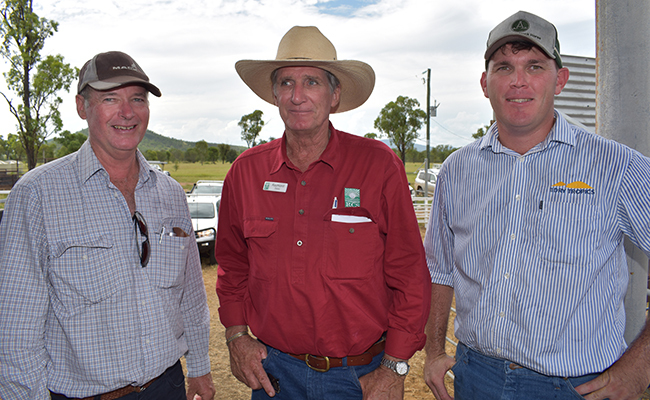 Michael Pini, Lancewood, Lyle Gilham, Suttor Creek Pastoral Co., and Matthew Salmond, Lestree Downs Pastoral Co.
William Fordyce, Hillalong Station, near Nebo, and Clay Kenny, Llanarth feedlot, near Belyando Junction. The aim of the day was to demonstrate how well-managed forage systems can contribute significantly to the profitability and sustainability of a grazing business. 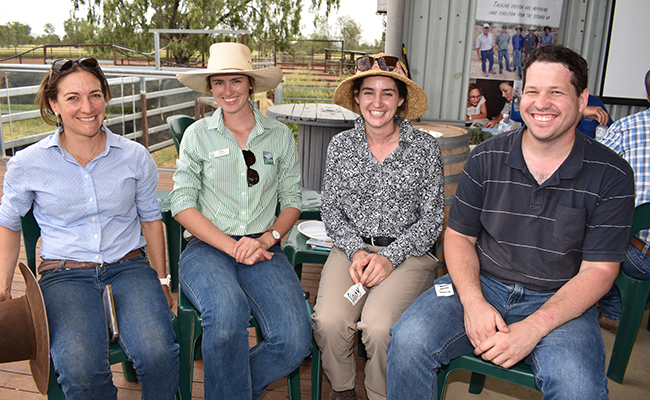 Five quality speakers from Resource Consulting Services (RCS), DAF and the cattle industry shared their knowledge and experience. Event organiser LDC Senior Grazing Field Officer Brendan Smith said the day had been designed to start new conversations. 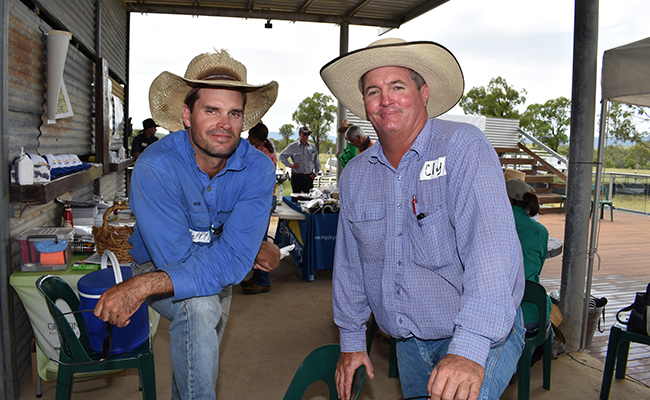 “Graziers are seeking knowledge about grazing management and animal husbandry to help them apply good grazing principles to differing land types” Mr Smith said. “They’re also looking to increase their observation and monitoring skills to see subtle changes over time in livestock, soils, and pasture plants, so they can make informed and timely adjustments to grazing systems. 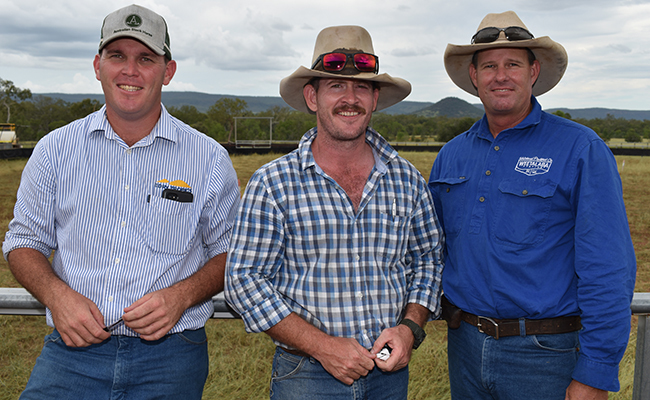 “Informed business decisions lead to Improved financial sustainability and ecological benefits, and this is important for a thriving cattle industry in the Bowen Broken Bogie (BBB) catchment. “All speakers addressed these issues, and it invoked a lot of discussion, with producers talking about what works, what doesn’t, and throwing around ideas about what they’d like to trial on their land,” he said. Presenter, Raymond Stacey, of RCS, said graziers should not underestimate the value of monitoring, and spoke about monitoring tools including graze charts, paddock records, business analysis, landscape health monitoring and stock days per hectare per 100mm of rain. Beef extension officer Jim Fletcher, of DAF, spoke about how NIRS technology enables producers to assess diet quality, so they can make proactive, timely decisions about the timing of weaning, age to wean down to, when to sell stock before they begin losing weight, and how to identify nutrients that are deficient in their diets. Agricultural economist Tim Moravek, of DAF, spoke about the benefits of spending time to do a grazing business analysis to help make informed and profitable decisions into the future. 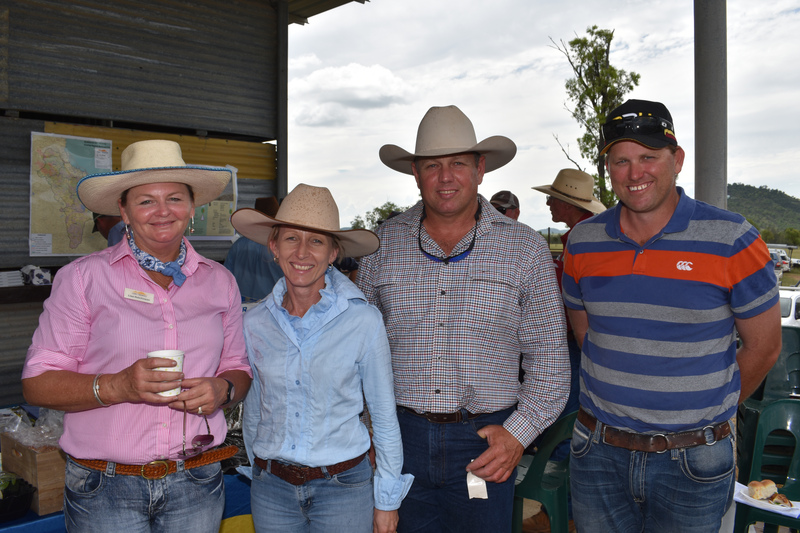 Charters Towers grazier Jane Weir, of Amelia Downs, also urged producers to spend more time in the office working on the business. “If you’ve got a pasture budget, you’ve got a risk mitigation tool, and that means you have options to survive the hard, dry times,” Ms Weir said. Clermont grazier Peter Anderson, of Glenlea Downs, said economical beef production must consider the needs of the animal and the forage plant at the same time. “Nutrition should always be front of mind. Do not wait until you see cattle slipping, that’s too late and you end up spending a lot of time and money trying to get them back into condition,” Mr Anderson said. Mr Smith said the workshop was the first in a series of training activities the LDC team was delivering in the region this year. Other activities include forage budgeting, photo monitoring sites, assessing pasture diet quality with Faecel NIRS testing, soils testing and analysis, as well as one on one consultation. Guest speakers Peter Anderson, Glenlea Downs, and Raymond Stacey, RCS, pictured with workshop organiser LDC Senior Grazing Officer Brendan Smith. Guest speaker Jane Weir, Amelia Downs, Bec Clopperton, RCS, Daisy Denny, DAF, and guest speaker Tim Moravak, DAF. 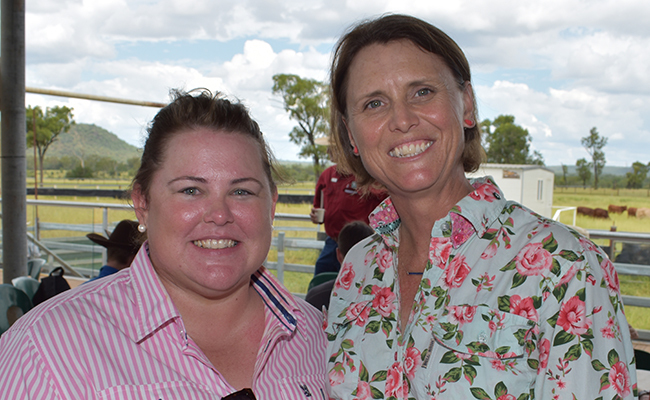 Vivian Finlay, DAF,(left) with Julie Muirhead, Weetalaba Station. 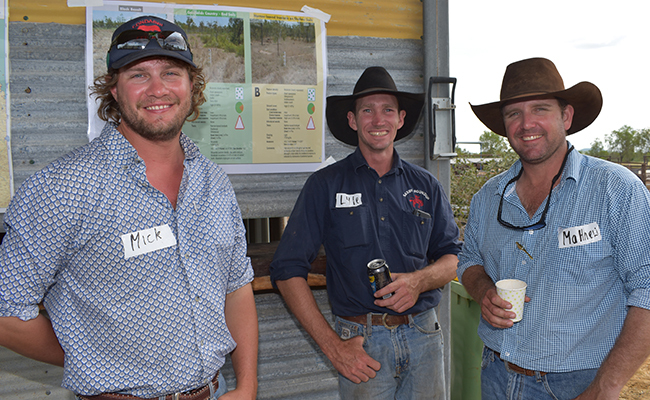 LDC Senior Grazing Officer Brendan Smith, with (from left) guest speaker Jim Fletcher, DAF, and Reid Muirhead, Weetalaba Station. Reid and wife Julie kindly allowed LDC to run the workshop at Weetalaba.